MultiBrief: Can listening to music at work make employees more productive? Can listening to music at work make employees more productive? "Whistle while you work," the popular song from Disney’s "Snow White and the Seven Dwarfs," might be more than just a catchy tune. A new survey by Robert Half/Accountemps reveals that most professionals who work in an office like listening to music at work — and are more productive when they do. But are workers really more productive when they listen to music at work? Since the employees are gauging their own productivity levels, is it possible that perhaps they just think they’re more productive? Music can help alleviate stress, motivate and inspire workers — and even help maintain energy levels. Music can reduce levels of anxiety and depression. Music can improve memory and attention — blocking out distractions. "Also, aside from efficiency, the ability to listen to music during the workday may ultimately increase job satisfaction and morale," Steinitz says. And he isn’t the person who believes that music at work can be beneficial. Brad Deutser, president and CEO of Deutser, a management consulting firm, and author of "Leading Clarity: The Breakthrough Strategy to Unleash People, Profit, and Performance," is also a proponent of this practice. "Our work supports research that shows music has a positive effect on the brain in the work environment," Deutser says. "The ultimate determinate of music’s impact in the workplace is directly linked to the organization’s specific environment, as well as its unique culture." However, he notes that there are several factors that determine if music is appropriate in a particular office, including the type of work being performed, whether the work is solitary or collaborative, and even the genre of music being played. "Overall, we believe, when used within the accepted organizational norms, music can impact the overall positivity of an organization and contribute to an engaged and productive workforce," Deutser says. At his company, employees can listen to music in their personal work areas, but it is also used in other fun ways. “We also incorporate music to change energy in the office with spontaneous ‘Michael Jackson Minute’ where we blast music throughout the office and encourage the entire workforce to join together in a central place to take in the music and reset the tone/energy of the office,” Deutser explains. "We also incorporate music to intentionally align the mindset of some in advance of our more creative meetings through the use of our Huemanize MindMap system, which offers select exercises to encourage employees to identify music in their head and sing the lyrics silently." In this scenario, he says music is used to reorient employees from their current state to a state that allows them to be more productive and engaged. Depending on the nature of one’s work and workstyle, music can be a distraction from high priority tasks. For example, music may cause a lack of focus for projects that require in-depth analysis or critical thinking. Others may perceive peers that wear headphones as unapproachable, which can affect collaboration. Depending on the work environment or industry, listening to music at work may appear unprofessional. 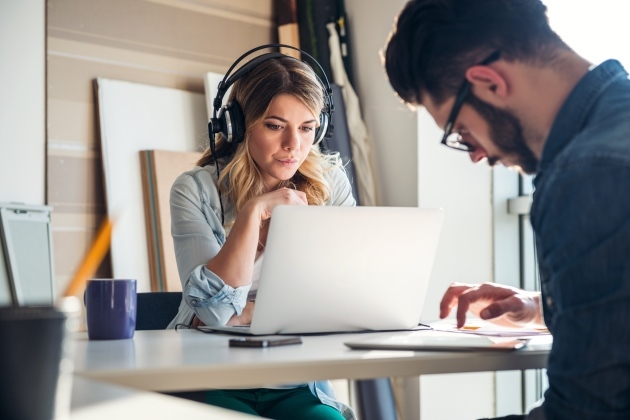 If your company allows employees to listen to music at work, it’s important to implement some type of guidelines or “etiquette rules” to ensure that employees are not disrupting other workers. Steinitz says employees should be respectful of their colleagues, and occasionally check in to ensure that they’re not being disturbed by the music. In a shared office space, employees should use headphones. “Keep the volume low enough to hear the phone ringing or to hear someone approaching the workstation,” he says. Also, singing, humming, whistling, tapping feet, or drum solos using fingers, writing utensils or other office objects should be avoided.